We have a firm commitment to quality, organization, consistency, and the highest ethical standards. Our world class team has experience in a wide range of architectural project types and styles; and we love to design projects that bring communities together. 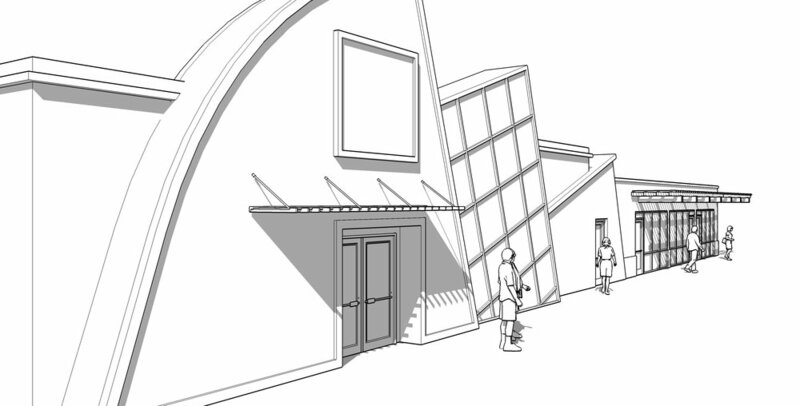 We have the experience to take your project from initial design sketches through construction administration, with creativity and due diligence. Creating vibrant public spaces that bring people together, from intimate cafes to large shopping centers. With experience in theme parks, hotels, and community centers, we are here to make your project a memorable one. Bringing a new look to church projects across the country, utilizing architecture to reach out to a new generation. Making your home a full expression and extension of your values. Crosspointe was a young, growing, and vibrant church, occupying an old 60's A-frame church. They turned to Ethos Architecture to develop a new image for their church as they expand. By modifying an existing 40,000 square foot warehouse building, Crosspointe was able to get the space they needed for their growing congregation for the budget they could afford. In utilizing many restored existing elements, rather than completely new finishes, they were able to achieve a funky vibe at a reduced cost. Their expansive lobby, and roll up door to create an indoor-outdoor space with the exterior patio, creates a welcoming environment to the newcomer, and a cozy environment to linger with friends between services. At the same time, a two-story indoor play structure, and full wall Noah's Ark murals keeps the kids occupied. Ethos Architecture recently worked for LEGOLAND California Resort as principle designer for LEGO NINJAGO World, the family theme park’s newest land which features NINJAGO The Ride. For more information on NINJAGO World, visit: Legoland California's website. The owners of this home wanted to focus on the living space with large windows overlooking their lake view, and have that space reflect their contemporary style. This home is bold in its expression of structure and style. Ethos Architecture recently worked for LEGOLAND WATER PARK as principle designer for Surfer's Cove, the family water park’s newest land. For more information on Surfer's Cove, visit: Legoland California's website. This project was a significant remodel/addition, which added new gathering spaces to the house, as well as developing the bland stucco exterior into a beautiful craftsman style upgrade. Nantucket dormers, a new game room, and a deck overlooking the creek view greatly enhanced this home. Ethos Architecture recently worked for LEGOLAND California Resort as principle designer for LEGO DEEP SEA ADVENTURE, the family theme park’s upcoming land which features the DEEP SEA ADVENTURE ride. For more information on DEEP SEA ADVENTURE, visit:Legoland's press release for the project, and a video preview they released as well. Crosspointe is a young, growing, and vibrant church, occupying an old 60's A-frame church. They turned to Ethos Architecture to devolop a new image for their church as they expand. Our design offers a contemporary new look to reflect the style of the young congregation. An emphasis on the outdoor courtyard utilizes Southern California's ideal weather, and roll up glass doors to the lobby will create a free flow between the inside and outside. The courtyard follows the site's natural contours, and creates many small pocket spaces for groups to get together, without the "red square" feeling that many churches have with very open courtyards. 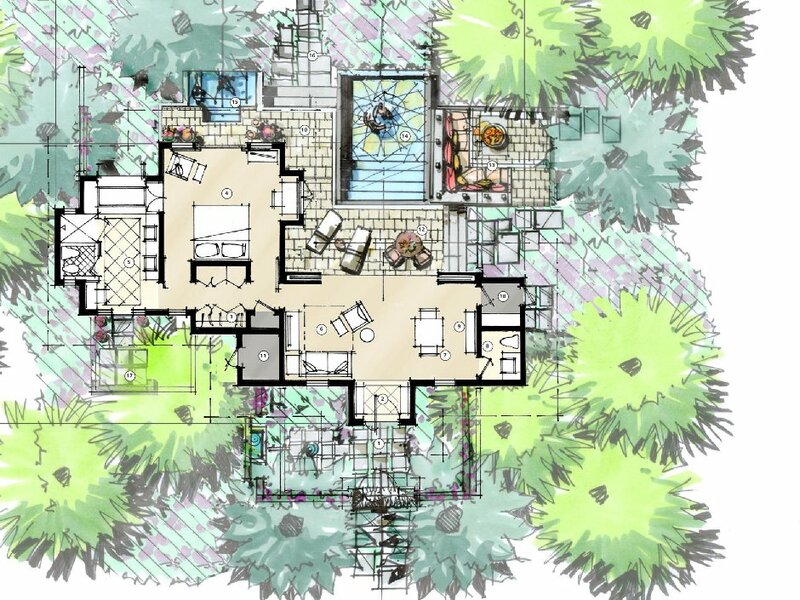 Multiple levels of visual interaction will connect these small groups, and create a very dynamic courtyard experience. This major retrofit combines modern urban materials of the corrugated metal shark fin, and plate glass of the pool deck to create a subtle impression of the sea. At night the neon pool lights reflect off the glass to create a dazzling hypnotic effect. Disney has long wanted to create a new resort at one of its most requested destinations, Hawaii. 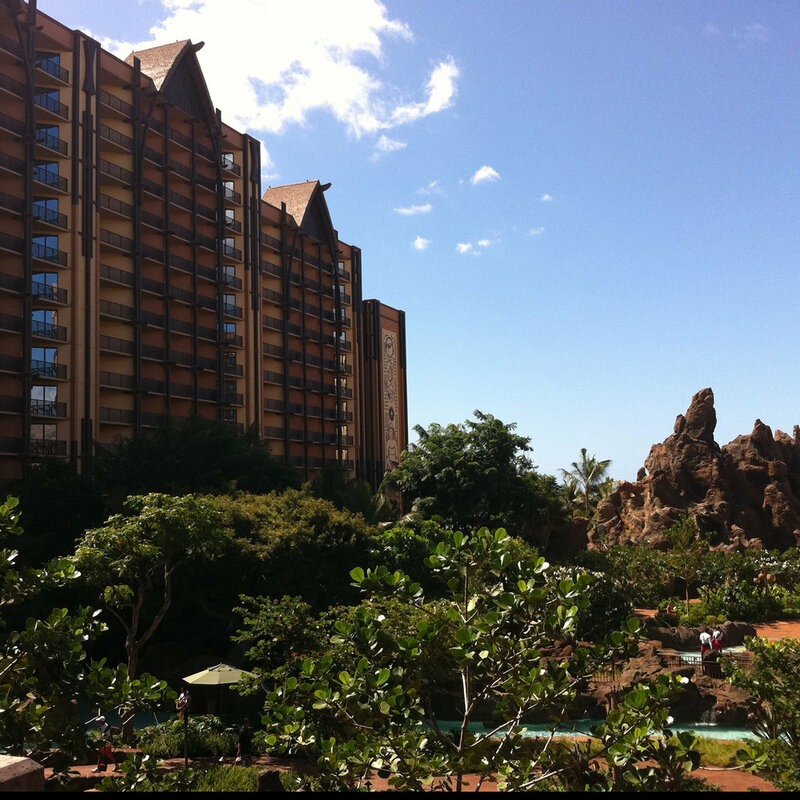 The Disney Grand Hawaiian will be Disney's first major resort hotel not attached to a theme park. However, in this case, the hotel itself might be classified as a theme park. The hotel features a large volcano and waterpark in its central courtyard, amazing views to the beach, a world class restaurant, convention center, performance stages, a wedding garden and much more. *Scott Holcomb worked on this project as a designer with WATG. Architects Hawaii was the architect of record for this project. The City of Laguna Hills proposed a plan to create a world class sports park and community center within an existing manufactured drainage basin. Although ambitious, this development would soon become the jewel of the city, and a treasured asset for the entire community. The Laguna Hills Community Center houses a large dividable multi-purpose space for everything from banquets, to weddings, to dramatic stage plays. A computer library lets anyone coming in do research on the web; and children's classrooms, and protected play areas, allow the kids to explore the site's many historical artifacts in safety. In addition to this, the community center offers a 20,000 square foot gymnasium and physical activity room that brings hundreds of visitors in every week to participate in a variety of activities throughout the year. Across the site of the building are numerous sports fields, including soccer and baseball fields, as well as a skate park and roller hockey rink. There are several facilities for having a picnic or bar-b-que, and there is a large children's park sporting rock features, fountains, and huge themed jungle gyms. Throughout the building and the site runs a paleontological and dinosaur theme. This was inspired by the large numbers of fossils found on the site, and serves to remind us of the history of the site, and our responsibility to preserve it for generations to come. *John Bates is the architect of record for this project. Scott Holcomb as a job captain while working at John Bates Associates. David Volz Design was the Landscape Architect. Photography by Ethos Architecture. This project was originally conceived as a traditional worship venue for Mariner's Church, which could also become an asset to the community as a beautiful Wedding Chapel. This traditional craftsman style chapel brings all the elegance of stone and heavy timber architecture to this otherwise modern campus. The large interior wood trusses, and stark contrast of natural lighting create the optimal environment for contemplation, worship, and prayer. The reflecting lake and working bell tower complete the beautiful image of this picturesque landscape. *Scott Holcomb worked on this project as a designer while at Visioneering Studios. Mars Hill Studio was the architect of record. Photography by Ethos Architecture. Khassa Rah is a monumental project, incorporating a 100 acre lifstyle center, a mariana, a 5-star hotel, in addition to two 7-star resorts on man made islands, in the beautiful atolls of the Maldives. 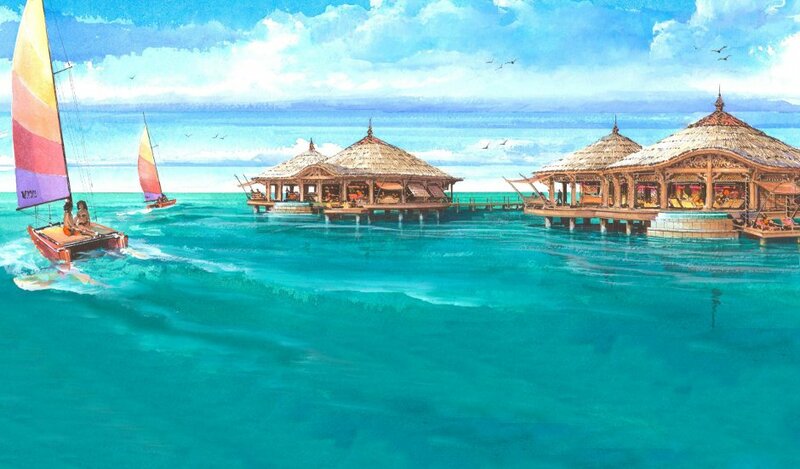 Our project (one of the 7-Star resorts), included designing luxurious beach villas, island villas, water villas, as well as exorbitant arrival buildings, restaurants and health clubs. Everything about this project was of the very highest quality, and creativity was encouraged to the upper limit of feasability. *Scott Holcomb worked on this project as a designer for WATG. Christ's Church of the Valley is an enormous church in the prosperous area of Peoria, Arizona. Their 10,000 member congregation is lead by the dynamic pastor Don Wilson. Our project was to create a new Children's Ministry Building, and an Alternate Worship Venue which would also serve as the church's Youth Building. Each of these projects could easily dwarf most entire churches in America, in both their size and complexity. *Scott Holcomb worked on this church as a designer while at Visioneering Studios. Todd & Associates is the architect of record. Photography by Ethos Architecture. This 20,000 square foot clubhouse, perched on the hilltop between the first and eighteenth holes, commands amazing panoramic views of the Black Gold Golf Course and the beautiful rolling hills of Yorba Linda. This two story facility includes a luxurious banquet hall, with a full service commercial kitchen, catering everything from weddings to fundraisers. It also has a first class pro shop with everything for the novice to the avid golfer, and an upscale bar for post-game lounging. Downstairs there is a snack bar, cart barn, as well as men's and women's locker rooms for the convenience of the golfers on their way to, or back from, this award winning golf course. *John Bates is the architect of record for this project. Scott Holcomb worked on this development as a Job Captain while working at John Bates Associates. Photography by Ethos Architecture.